In wildlife conservation, one of the fundamental questions we work with is, will this population we are trying to save still be here in the future? Obviously, the goal of our conservation efforts is to make the answer a resounding “YES!” The ability of a population to persist into the future is referred to as population viability. But without a time machine, how can be sure a population is viable or for how long it will persist? This is where the modeling comes in. Models allow us to construct representations of a system (a population in this case) so that we can manipulate that representation to answer questions that are too difficult to answer by observing the actual system. Models predicting how populations will behave in the future can be incredibly useful to researchers and managers. A population model designed specifically to estimate population viability is called a population viability analysis or PVA. At its most fundamental level, a PVA operates by balancing inputs and outputs and seeing how much is left after some length of time. For populations, inputs include births and immigration and outputs include deaths and emigration. If a population loses more individuals than it produces it has low viability and will eventually go extinct. A PVA can be made more complex by allowing juveniles and adults to have different mortality rates or by introducing random variation in birth and death rates to simulate the natural variability found in real populations. Multiple populations can be included within a single PVA so that interactions among populations, such as immigration and emigration, can be explicitly stated. When the spatial arrangement of these populations is considered the PVA is said to be spatially explicit. Spatially explicit PVA’s can incorporate the effects of different habitats or landscape features, such as roads or agriculture, on population viability. Researchers can even use predictions of urban development or climate change to predict population viability under future conditions. With all of their potential, PVA’s are an important part of The Orianne Society’s mission to save the Eastern Indigo Snake. I am working with Dr. Kevin McGarigal at the University of Massachusetts to produce a population viability model for Indigo Snakes in Central Florida. Although Central Florida provides some important strongholds for Indigo Snakes, many of these populations are isolated by urban development and agriculture. High road densities inflict high mortality rates even in areas dominated by natural habitat. Indigo Snakes are often found in disturbed or human modified habitats in Central Florida but it is unknown if Indigo Snakes in those habitats represent viable populations or populations on the road to extinction. With this new population model, The Orianne Society will be able to identify viable populations, determine what factors allow them to remain viable, and develop management plans for populations with low viability. The model that Dr. McGarigal and I are developing has another twist to it in that instead of directly modeling populations it actually models the behavior, survival, and reproduction of individuals. This type of model is called an individual-based model, or IBM, and it allows us to incorporate a greater level of detail and realism into the model. To understand what is happening at the population level we simply count up the number of individuals remaining in our modeling environment and where those individuals are located. An IBM works by applying a series of relatively simple rules (see Flow Diagram), such as “Which habitats to move to,” “How far they should move,” or “When they should reproduce,” to all of the individuals (referred to as “agents” in the IBM world) which allows them to act in way that gives the appearance that each individual is thinking on its own. I like to illustrate this with an example from one of my favorite movies, The Lord of the Rings. In the big battle scenes where thousands of computer generated soldiers were fighting, the soldiers were not animated individually one at a time but by software using IBM principles. Each soldier followed a set of rules such as “Look in this area,” “If enemy soldier is present, go towards it,” “Attack,” and “If successful, repeat.” By applying these simple rules to thousands of soldiers, producers were able to generate complicated battle scenes. We are using this same basic process with different rules. The rules we will apply to our simulated Indigo Snakes include “Travel this randomly selected distance,” “Preferentially use this habitat type,” “Avoid traveling through this habitat,” “If you cross a road, you have a 50% chance of being killed,” and “Stay within this distance of your home range center.” We will also include reproduction rules, such as “If you are at least four years old, lay between four and ten eggs,” that will be applied during the simulated breeding season and allow new individuals to be born into the population. Although this population model will have incredible potential, building such a model is no easy task. The biggest challenge will be collecting data to parameterize the model in order to simulate a realistic Indigo Snake population in Central Florida. To do this, we need real field data on movement patterns, habitat selection, within-species interactions, survival, and reproduction. Our ongoing radio telemetry study in Highlands County, Florida will provide some of this information and the rest will come from other studies on Eastern Indigo Snakes or expert opinion. For model variables for which we do not have adequate field data, we can test a range of values provided by Indigo Snake biologists using a sensitivity analysis to determine how important that variable is on the model output. 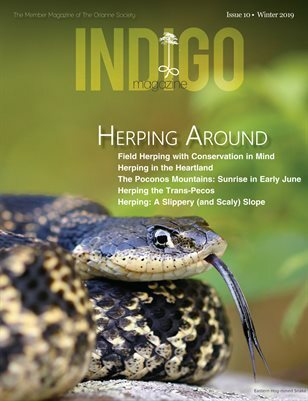 But once we have the model developed and refined we will have a model that can be applied to Eastern Indigo Snake populations in any landscape in Florida, or even Georgia, provided the appropriate input data is available from Indigo Snakes in the modeling area. We hope that this model will improve our ability to conserve Eastern Indigo Snake across their range.